I was enjoying a sunny afternoon at the beach, in search of washed-up treasures in the sand. A young couple arrived, along with their Dachshund puppy, who had evidently arrived for his first swim lesson. The little dog trotted to the water’s edge, and with a display of bravura equal to that of a Great Dane eyeing a plastic mouse squeaky toy, began to bark loudly and fiercely at the water. Then, of course, he made an about-face and skedaddled back to his beach towel! His owner picked the little puppy up, and headed back to the water with the dog in his arms. Slowly, he lowered the dog so that the puppy’s feet just barely touched the water. The dog’s legs began to whirl as he was gradually lowered into the water, to the delight of everyone watching. By the end of the afternoon, the Dachshund had conquered the mighty ocean (in his mind, certainly) having taken a few swims all on his own! A breed of dog with the word “water” in its name (Irish Water Spaniel or Portuguese Water Dog, for example) should adapt easily to swimming. Setters, Retrievers, Akitas, Terriers, and Poodles are also strong swimmers, who love to play, hunt, and retrieve in the water. Some breeds (such as Cocker Spaniels, Labrador Retrievers, Newfoundlands, Chesapeake Bay Retrievers, and Nova Scotia Duck Tolling Retrievers) have specific features designed to help them become skilled swimmers: such as oily or wiry coats that repel water, webbed feet for additional propulsion, and thick tails that act as rudders. Snub-nosed varieties of dogs, (Bulldogs, Boxers, and Pugs, for example) who are prone to breathing difficulties on land should not be expected to become proficient swimmers. Breeds with short legs, such as Corgis, Bassett Hounds, and Dachshunds are usually not comfortable in the water. But just like humans, sometimes a dog’s unique personality and desire are strong, making them determined to succeed – just like that little Dachshund getting his water wings. Help your dog learn how to do the dog paddle! Your dog’s first experiences while learning new skills can set the tone for her future frustrations or accomplishments. It may take lots and lots of practice to teach your dog how to swim, or perhaps after one or two dunks your pet will love swimming with you any chance she gets. In either case, try to make her lessons fun for the two of you. You may want to enlist the help of a dog who is already a good swimmer, and one your pet is friendly with and used to being around. If you can handle more than one dog comfortably, or have friends to help, having your pet watch other animals relax and swim in the water may be a great way to help a novice overcome her initial qualms, and gently coax her into the water as she naturally mimics a pack leader. 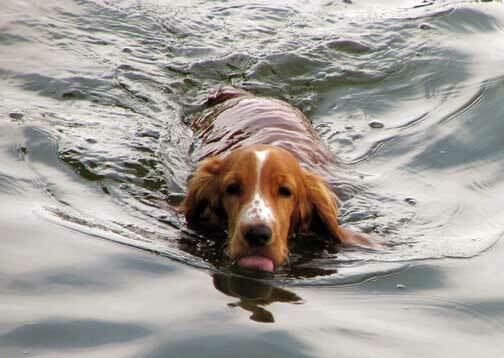 Try to avoid teaching your dog to swim in a river – currents may be fast and treacherous. A lake, pond, swimming pool, or calm ocean inlet are all good places to start. Choose a quiet location – too much noise (and too many people) may be alarming and definitely a distraction. Never scold your dog – always teach with love, words of praise, and treats. Never force your dog by throwing, pulling, or pushing her into the water and expect her to magically swim – these techniques may only make her fearful, and anxious to get out of the water as quickly as possible. Go in the water with your pet and cradle her under her tummy while you teach her how to paddle. If she only paddles with her front legs, try holding her rear end up a little to get the back legs working (get her “running” in the water). A dog who uses only her front legs will expend too much energy and may sink. A dog’s natural head position should be relaxed, above the water, and slightly forward. Follow the above suggestions, and allow your dog to swim as you support her tummy and chest, until you feel she is becoming comfortable and relaxed. Try letting go for a few seconds—if all goes well, gradually increase her “free swim” until she no longer needs your support. Let her walk towards you in the water as you slowly back up. Continue to back up into deeper water, until she can no longer touch bottom. If she begins to swim towards you, continue backing up a little more, offering her lots of praise and encouragement. If she becomes fearful, offer her the same praise and encouragement while you turn her around and both head back to shore. Teach your dog how to get out of the water! Most dogs only become fearful and panic-stricken in a body of water when they can no longer feel the bottom. 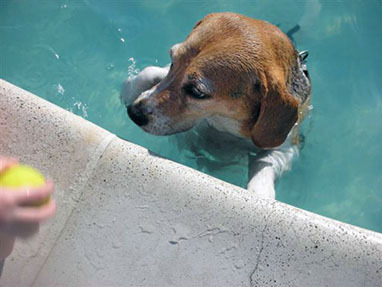 Don’t allow them to become frantic as they try to escape – teach your pet how to get in and out of the water calmly – if you swim in a pool, train her to enter and exit only by the stairs, and if the dog is small, consider putting bricks or additional steps on the stairs to help the dog’s short legs gain their footing easily and securely. Don’t let your pup poop herself out! Swimming is a great exercise, but should be exercised with great caution! An excited or nervous dog may not have the same amount of stamina as she does exuberance – take frequent rest breaks, and if you are swimming in the ocean, be aware of the tides. Outgoing tides have a lot of pull, and can move humans and animals far from shore very quickly, sometimes to distances that are just too great for either to surmount. 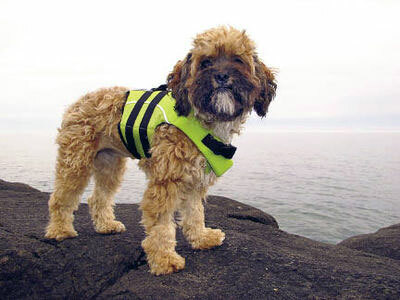 If you plan to do a lot of swimming, water sports, or boating with your dog you should consider fitting her with a flotation device and getting her used to wearing it comfortably while swimming. Remember it’s almost impossible to put on a life-saver in a state of panic during an emergency. 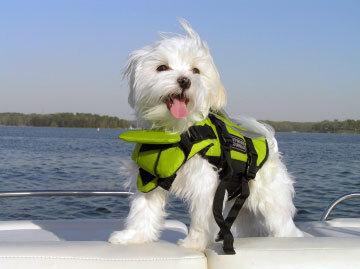 Your dog’s flotation device should be securely attached prior to her entering the water. Some flotation devices have handles on top so that you can grab the animal and lift her up and out of the water. A catastrophe can happen in seconds, and you only have a very small window of opportunity in which to provide life-saving measures. Proper training in mouth-to-nose resuscitation, as well as effective chest compression techniques for a dog in distress can be the difference between life and death. Small animal first aid training courses which include resuscitation are available. A Pet’s Life sponsors a comprehensive course, and more information can be obtained here or by sending an inquiry to info@apetslife.ca. Even if the animal resumes breathing on her own, always take her to the veterinarian immediately. Dogs can get sunburned, too! Their paws, noses, and ears are directly exposed to the sun, as is the skin of all short-haired animals, animals recently groomed for hot weather, and albinos, and are therefore prone to burning. Speak to your veterinarian about purchasing a sun screen for your pet, and use it as required. You might consider a pet T-shirt for coverage as well. Try to rinse your pet off as soon as possible after swimming – the salt from the ocean or the chlorine from a pool can cause damage to your pet’s fur, skin, eyes, and ears. Make sure to dry her ears well, and wrap small dogs (or any shivering animal) in a dry towel or blanket. Body heat can dissipate quickly, and your pet might be colder than normal from the exercise and fresh air. Remember to teach your dog not to drink the water in which she is swimming! Supply her with lots of cool fresh or bottled water. Salty, chlorinated, or polluted waters can cause mild to severe tummy upsets, or sometimes even life-threatening illnesses. 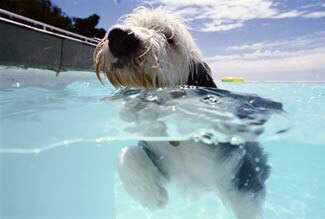 Large meals right before swimming are not a good idea, but your pet will be hungry and thirsty at day’s end. Watch your pet while she swims. A happy dog may not want to leave the water, even if she has become tired. If you notice your dog is panting excessively or wheezing, it’s time to take a rest break! 10 Common Myths About Dogs Is Your Pet In Pain?